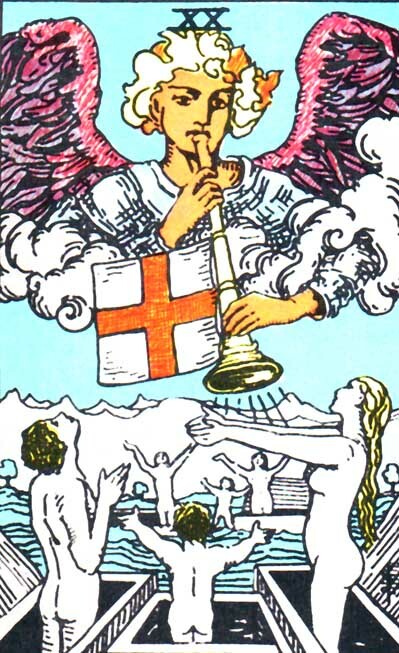 The Star is the seventeenth Major Arcana of the Tarot. It represents a naked woman, kneeling with one foot in the water and the other on the land and pouring liquid into the water and onto the land. On the sky, there is a great, radiant star of eight rays, surrounded by seven lesser stars, also of eight rays. 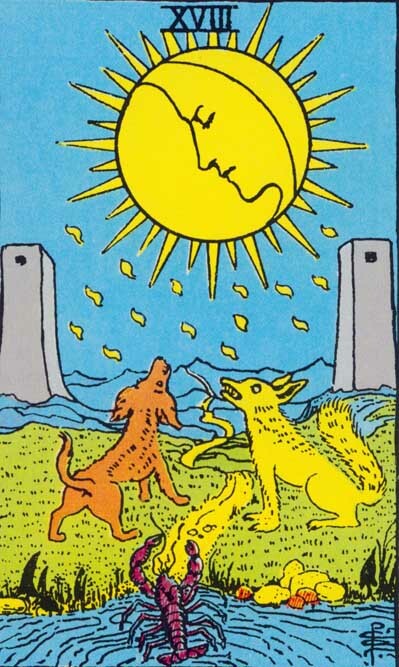 It is the first of the three consecutive trumps representing the luminaries: The Star (17th), The Moon (18th) and the Sun (19th). 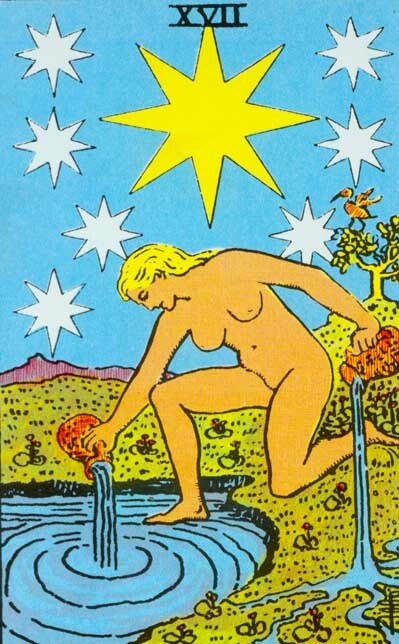 According to A. E. Waite, the divinatory meaning of the Star is expressed by the following words: „loss, theft, privation, abandonment; another reading says-hope and bright prospects “. 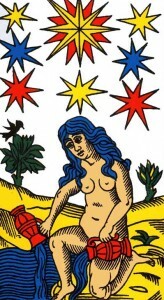 Reversed, the Star can signify, according to the same author: „arrogance, haughtiness, impotence“. 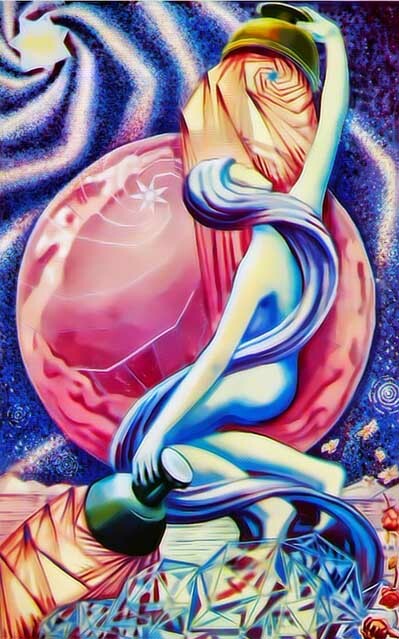 In Kabalistic terms, the Star of Tarot is „Sephira Binah, which is supernal Understanding, who communicates to the Sephiroth that are below in the measure that they can receive her influx“. „ Where . . . all things are diaphanous; and nothing is dark and resisting, but everything is apparent to every one internally and throughout. For light everywhere meets with light, since everything contains all things in itself, and again sees all things in another. So that all things are everywhere, and all is all. Each thing likewise is everything. And the splendour there is infinite. For everything there is great, since even that which is small is great“. 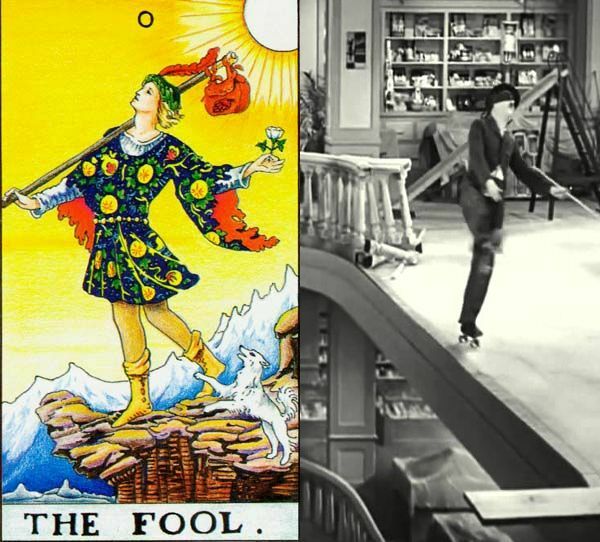 In „The Book of Thoth“, Aleister Crowley connects this Major Arcana to the zodiacal sign of Aquarius and to the Hebrew letter He. The ceremonial magician tells us that „ the picture represents Nuith, our Lady of the Stars. For the full meaning of this sentence it is necessary to understand the first chapter of the Book of the Law“. („The Book of the Law“ or „Liber AL vel Legis“ is a text dictated to Ouspensky by Aiwass, a non-corporeal being, containing the principles of Thelema, the religion inaugurated by Crowley; Nuith is one of the goddesses, in Thelema, named after Nutm the Egyptian sky goddess who leans over her husband and brother, Geb, the Earth God. She is usually depicted as a naked woman who is covered with stars). For Papus, there are two main ideas expressed by this symbol: the expansion of fluids and their eternal renewal. Opposition to destruction. No destruction is final. Everything is eternal and immortal in God – IMMORTALITY – creation of the human soul. The fall is not irreparable. This is whispered to us by the intuitive sentiment we name HOPE. The Visible Universe contains the source of its Divinization in itself. This is THE FORCE WHICH DISPENSES THE ESSENCE OF LIFE, which gives it the means of perpetually renewing its creations after destruction“. Share the post "The Star – Major Arcana Tarot Card Meaning, according to Waite, Ouspensky, Crowley and Papus"